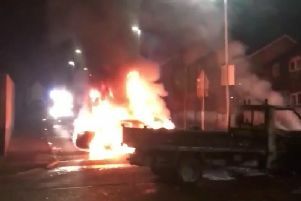 Independent republicans refused to back a motion condemning the recent violence in Derry at a special council meeting on Monday. Colrs. Gary Donnelly, Warren Robinson & Darren O’Reilly abstained from the vote on DUP Alderman Hilary McClintock’s motion. Colr. Donnelly asked if the condemnation extended to the firing of plastic bullets. Colr. O’Reilly said condemnation was futile and said the motion was an attempt to put some councillors behind a ‘black ball’.